Our Programme Manager for Liberia John tells us about the recent celebrations in Liberia, held by the Mary’s Meals team to mark the country being declared Ebola free! Great news – this week The World Health Organisation declared Liberia Ebola-free! When Ebola brought a six-month halt to our usual feeding programme in Liberia, Mary’s Meals mounted a crisis response, delivering food aid to thousands of affected people, including patients infected with the virus. John, who works as our Programme Manager in Liberia tells us about a recent celebration in Tubmanburg where our Mary’s Meals team are based. On Friday the 8th of May all of the Mary’s Meals Liberia team came together in the grand surroundings of Tubmanburg City Hall. We were joined by two colleagues; Janet and Fiona, who both work for Mary’s Meals in Glasgow. They were visiting to see the programme’s progress and give support to colleagues after what has been a pretty tough twelve months for us in Liberia. Mary’s Meals staff are sometimes awarded with ‘golden mugs’ by their colleagues and Fiona presented Liberia’s Country Director Nic with one in recognition of the work undertaken during of the Ebola crisis. Nic accepted it on behalf of all Liberian staff after they were voted the ‘heroes of 2014’ by their colleagues in Glasgow. Nic then received a standing ovation at what was a very joyful occasion. It was through his leadership and vision that emergency feeding was able to take place during some very dark days in the country. It is amazing how far things have progressed and a testament to the Liberian people who have finally defeated Ebola through working together. Though we must not forget during this time of celebration that many Liberians have lost loved ones and are still trying to rebuild their lives in the aftermath of a terrible epidemic. Mary’s Meals are getting back to normal operations, we are even looking at expanding in Liberia; six months ago we would never have believed things could improve so quickly. A few days later, work in our Tubmanburg office was interrupted by the sound of children dancing and singing outside. The Government had closed schools for the day to give all children the opportunity to celebrate their country being proclaimed ‘Ebola free’. We thought most would spend time visiting friends or playing football. What we didn’t expect was a large number of children from the nearby Bomi Junior High to come during their free time and thank Mary’s Meals staff for work during the emergency period. All present had received emergency feeding during the height of the Ebola crisis. Sadly many of them mentioned the loss of loved ones but they also held placards high, stating how glad they were to survive. After speeches a single red rose was presented to Joseph in recognition of Mary’s Meals’ work and was followed by a symbolic shaking of hands (people are now able to touch each other again). The children then departed ready to begin another school week with support from Mary’s Meals, but this time without the risk of Ebola. 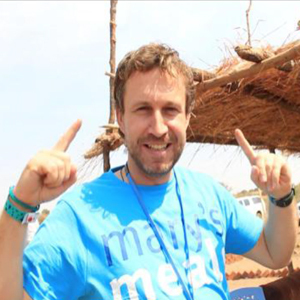 Thank you from all of us at Mary’s Meals for helping us to continue our work in Liberia during the Ebola crisis.